Paul Jarvis (@pjrvs) was asking himself these questions as he left the corporate world way back in the 90s. Now he works from his home in the woods on an island near Vancouver. He explores what he’s learned in his new book, Company of One: Why Staying Small is the Next Big Thing for Business. Previously, Paul was a freelance designer, working with clients such as Microsoft, Mercedes-Benz, and Marie Forleo. He now writes books, and makes courses and software products. Courses such as Creative Class, which teaches you how to “go pro” in your freelance career, and software such as Fathom Analytics, which gives you simple website analytics without tracking or storing your users’ personal data. How to manage your time in a company of one: Paul shares specific details on how he manages his time on a weekly basis, a monthly basis, and beyond. How to build your company of one around your skills: How does Paul build on his strengths and make his weaknesses irrelevant? How to make room for creativity by being organized: Learn why systems and processes actually enhance creativity rather than stifle it. Audible: Access an unbeatable selection of audiobooks. 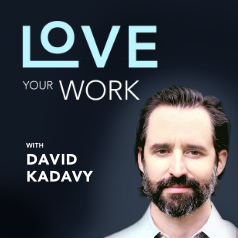 Get started with a 30-day trial when you go to http://audible.com/loveyourwork or text loveyourwork to 500500.